With the wedding of Kim and her fiancé Kris Humphries just over a week away new info is beening leaking everywhere about the big event. The magazine claims that Kim is leaning on her two sisters Khloe and Kourtney to help her with the “3 ring circus.” According to the magazine the girls have helped her choose the wedding cake, menu, music and wedding attire. 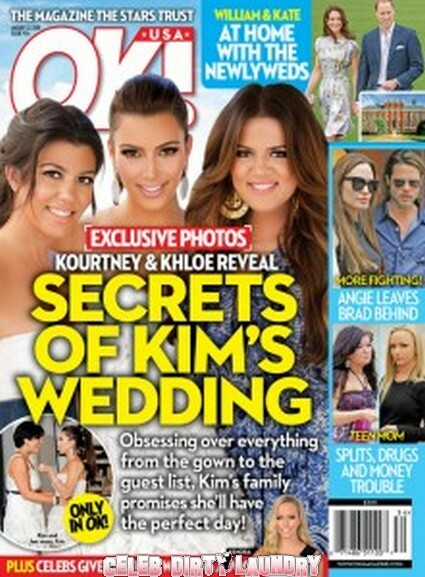 I am so over this Kardashian wedding news, it is everywhere. As we get closer to the big day that is all we are going to hear about. This issue of OK! just seems to be recycling the news that is everywhere. It does not look like there is anything new. However if you are tempted to find out more about how the girls are helping Kim pick up the current issue when it hits stands tomorrow!